The Agulhas current is the western boundary current of the South Indian Ocean. While the intensity of its volume transport can be directly related to the intensity of wind stress curl in the Indian Ocean, its vertical and horizontal structure is far more complex due to non-linear processes, such as the friction along the shelf slope or the viscosity (in the open ocean). Thus it is expected that the main features of the Agulhas Current differ across the different ocean models. To the South of the Agulhas Bank, the Agulhas current separates from the topographic slope and retroflects into the Indian Ocean. The retroflection is the consequence of accumulated positive vorticity by the current itself, due to increased planetary vorticity polewards and the shoaling of isopycnals in the vicinity of the Sub-Antarctic Front. The increased vorticity is however partially balanced by lateral friction, viscosity and cyclonic circulation on the Agulhas Bank. Thus, the position of the retroflection is controlled by multiple factors, non-linear processes that render realistic representation of the region by ocean models very challenging. Several models with very different frameworks have been developed locally (at UCT) and by international collaborators. Performing detailed diagnostics of the available simulations, and comparing simulations with observations, have become necessary steps in order to identify the specific biases of these models. The first exercise was based on the ORCA12 simulations produced by the DRAKKAR consortium. The model represents fairly well the observed spatial structure of the kinetic energy as well as the position of the retroflection. Nevertheless, the average kinetic energy is overestimated, the turbulent kinetic energy is underestimated and the Mozambique Channel mesoscale eddies show too stable trajectories. To summarize, the modelled surface currents are too stable compared to observations. The reasons for this bias remain unclear and motivated further tests of sensitivity, within the DRAKKAR consortium, of the energetics of ORCA12 upper ocean currents. In a second step, other simulations constrained to be as close as possible to observations (in particular satellite observations of sea level anomalies and upper ocean dynamics observed by ARGO floats), were analysed. Such reanalysis products, based on two different modeling framework, NEMO and HYCOM, were compared. It was shown that neither both intensity and structure of currents nor transport by the Agulhas Current show convergence across models. 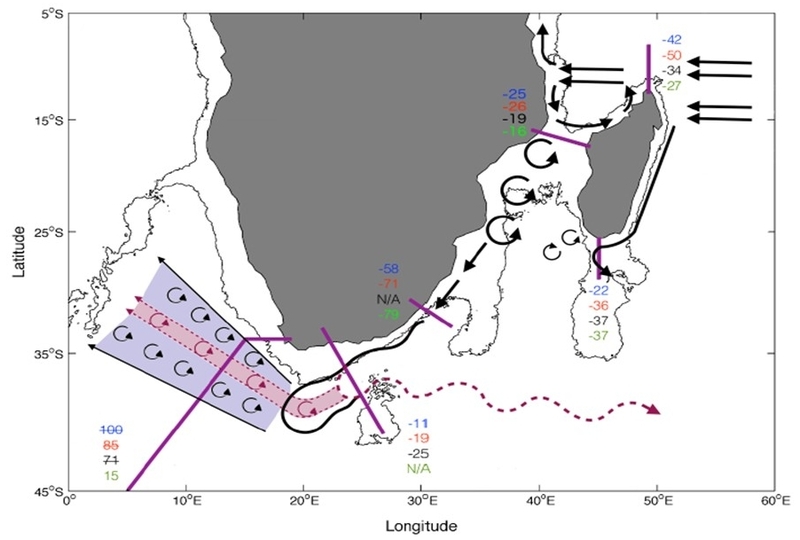 This has strong implications for both the potential applications of those products (widely used by marine biologists and industries) and for the way forward with regards to modeling the Agulhas Current. Schematics of the circulation around Southern Africa. Numbers indicate the transport (in Sv) of the main upper layer currents, in the ocean reanalyses MyOcean-NEMO (blue), HYCOM (red) and the Bluelink simulation (black, without data assimilation) and from observations (green). A negative transport denotes a net current through the section to the southwest.